Mournhold was badly damaged at the end of the First Era when it was attacked by Mehrunes Dagon. The Daedric Prince was defeated by Almalexia and Sotha Sil, and the city has been entirely rebuilt. The Tribunal Temple looms over Mournhold from an eminence to the north. Mournhold is a city on Morrowind's southern mainland, in the Deshaan region. 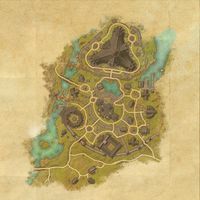 It is the capital of the Ebonheart Pact, and is traditionally controlled by House Indoril. It is the seat of the Great Moot, the ruling council of the Pact. 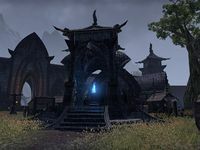 It is also the home the Tribunal Temple and seat of the Dunmer goddess Almalexia. The city is divided into several districts. The southwestern part of the city is occupied by the Guild Plaza, which is home to the halls of the Fighters Guild and the Mages Guild. In the west lies the Royal Bazaar, filled with numerous merchant stalls. The northern part of the city is dominated by the towering Tribunal Temple. In the east lies the Residential District, which contais several houses, The Flaming Nix inn, and the docks where students of Shad Astula can take a boat to their academy. In the southeastern part of the city lies the Plaza of the Gods, which houses the Artisans Craftworks - a smithy containing all the relevant crafting stations - as well as an alchemy store with a dye station and an enchanting store. It also contains the city's wayshrine and seven stalls of guild traders. In the very center of the city lies the Banking District, which is home to the city's main administrative building, called simply City Center. It contains the Bank of Mournhold and the rededication shrines. 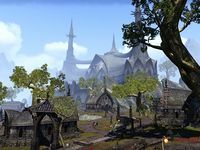 Mournhold Objective: Find out what's happening in the city of Mournhold. Mournhold Wayshrine is located by the southeast gate, near all of the crafting areas and the guild markets. It was moved from its old location outside the southwest gate.Which patch moved it? Mournhold also appeared in Arena, as well as the Tribunal expansion for Morrowind. This page was last modified on 11 March 2019, at 19:13.